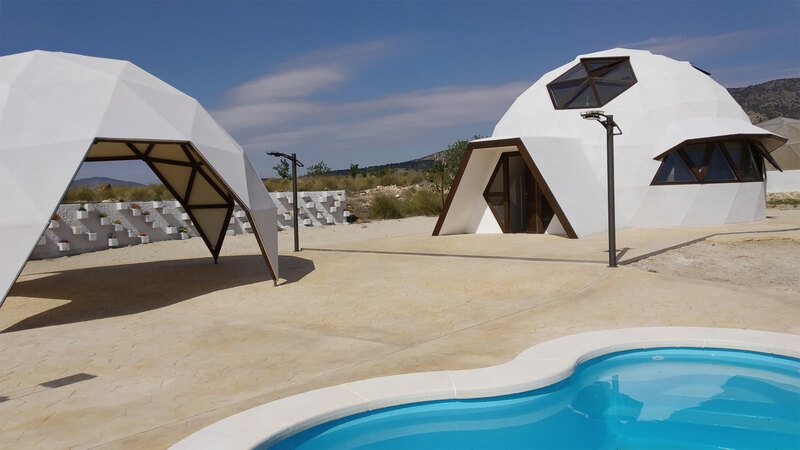 The design of the dome creates an ergonomic living space that is both energy efficient and environmentally friendly. The main house has an open plan living room, kitchen, dining room and a full bathroom; spiral staircase and a second floor with 1 master bedroom with full bathroom and a guest bedroom. There is also a garage, a green house and a pergola to the same geodesic design. 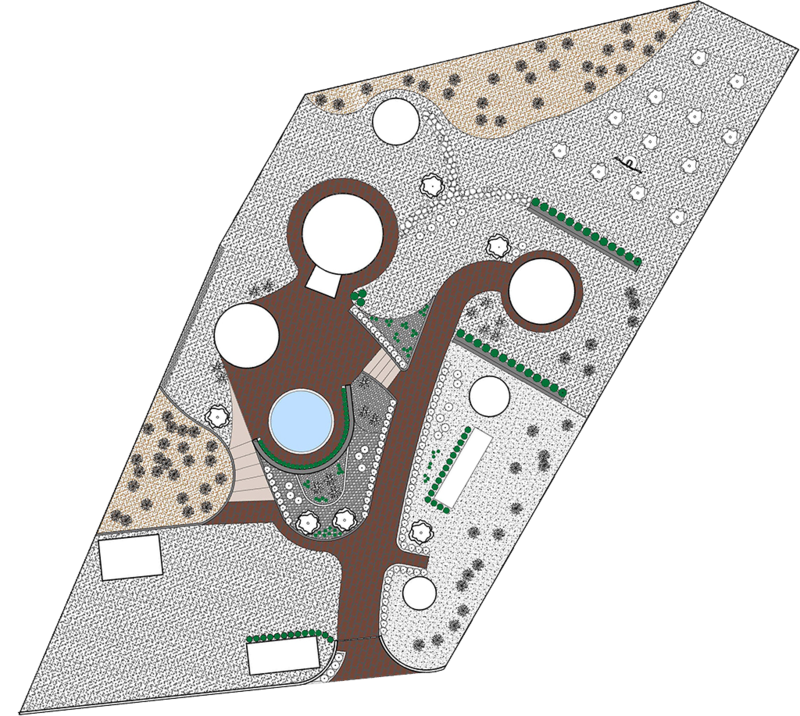 The project also consists of an orchard for the house and an orchard of fruit trees, as well as large gardens with aromatic plants of the area. There are 7 beautiful olive trees and a vertical planter of 18 meters in length (100 plants). The property benefits from a full solar system for autonomous electricity supply. Just a 10 minutes’ drive from Pinoso village and a 35 minutes’ drive from Alicante. Bioclimatic construction consists of creating homes considering the climatic conditions and the available resources (sun, rain, wind) to reduce the environmental impact and the consumption of energy which means pro-environmental and pro-inhabitant spaces. Energetic efficiency. Low maintenance. Pro-environmental. Healthy. Use of the winter sun through large windows on the east and south facades of the house. By means of eaves over the windows and the placement of deciduous trees. Cellulose throughout the cover. The geodesic structure allows a better and greater isolation when the entire external cover is isolated. The air is one of the materials with better insulating properties. Due to its low values of thermal conductivity, air chambers are used to interrupt the thermal flow between the interior and exterior. Geothermal construction based on a tunnel 3 meters deep that allows to use the stable temperature of the subsoil and provide the house with natural freshness in summer and winter tempering. They are healthy for the inhabitants of the houses, since it maintains a good level of air renewal, also conserving a healthy humidity level (on the contrary many air conditioning systems dry the air too much). The natural materials of lime and graphene allow to absorb CO2 from the atmosphere without emitting any polluting gas. It is therefore a natural environmental purifier providing in turn durability, flexibility and resistance to the building that instead of deteriorating increases its effects over the years. A healthy home for life. The white color of the cover acts as a passive protector from solar radiation which will favor a cool house in summer. Natural purification and recycling for irrigation of all the waste water from the house by means of water purifier of plants and microorganisms. Cleaning and maintenance of the swimming-pool water by ozonisation system. This building is the result of the experience and thorough study in the field to offer a warm and healthy home. An energy-efficient house with power independence where the last technological advances in solar panels or graphene paints and mortars have been considered as well as all the advantages and knowledge in the use of geothermal and solar energy. A set of constructions made consciously and with awareness to create the best place to live.